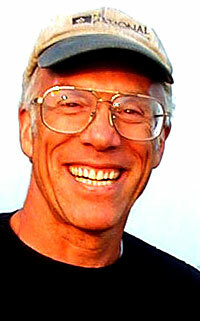 Ernest Frederich Schaufler, professor emeritus of horticulture at Cornell, died April 26 at the Cayuga Medical Center. He was 87. 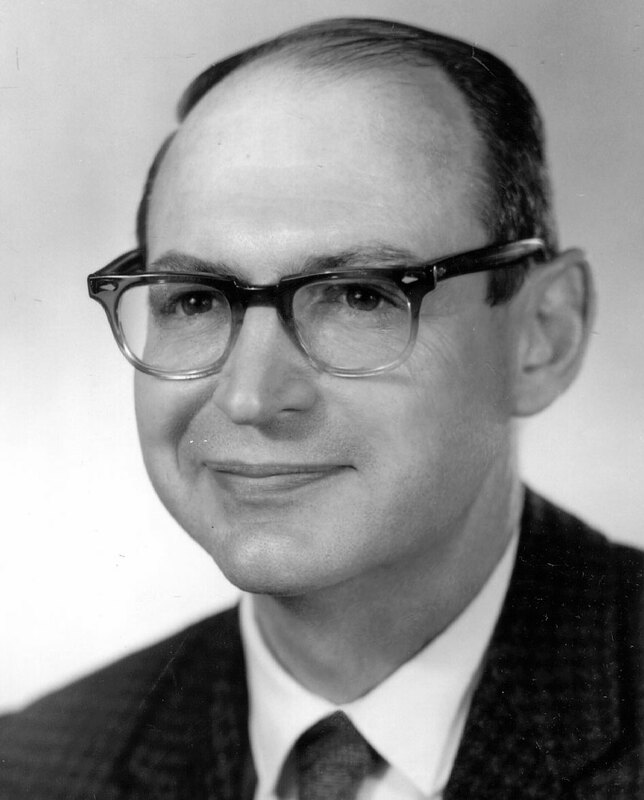 Born Dec. 29, 1923, in Brockton N.Y., two months after his parents emigrated from Germany, Schaufler entered Cornell in 1941, enlisted in 1942 and was called to active service in 1943. After serving in Europe with the Army Corps of Engineers, he earned his B.S. from Cornell (1948) and a Master’s in the field of horticulture and education (1952). His career was spent working at Cornell in the Cornell Cooperative Extension program as the 4-H club specialist in ornamental horticulture. He published more than 40 member and leader guides for annual flowers, perennial flowers, indoor gardening and landscaping youth projects as well as many extension booklets and the book “Gardening with Miniature Plants” (1987). He earned a reputation as a well-prepared teacher whose workshops and training sessions included hands-on projects. He set up the original Master Gardener kits for annual flowers, perennial flowers and house plants, and hosted a horticultural radio program for many years on WHCU and throughout New York state. After Schaufler retired from Cornell in 1983, he continued to share his knowledge with master gardeners and to judge 4-H exhibits at the New York State and county fairs. His many awards include the Epsilon Sigma Phi (extension fraternity) award for weekly radio programs, Alice Dorscher Horticulture Bronze Medal from the Federated Garden Clubs of New York State, Distinguished Service Award from the National Association of 4-H Agents, Epsilon Sigma Phi New York State Distinguished Service Award, the Gold Medal of Honor Horticulture Award from the New York State Nursery/Landscape Association and Cornell’s College of Agriculture and Life Science’s Alumni Award for Outstanding Faculty/Staff in 2002. Schaufler was Varna United Methodist Church treasurer and trustee, Varna Boy Scout Troop 45 chair, Varna Community Association chair, and for many years, active member and chair of the Varna Volunteer Fire Co., where he was made a life member in 1989. He also served as Ithaca Memorial Society president and chair for Acacia fraternity’s board of directors. He is survived by his wife of 61 years, Beverly Pratt Schaufler ’48, three children and their families. A memorial service is scheduled for May 14 at 10 a.m. at Longview, Bella Vista Drive, Ithaca. In lieu of flowers, donations can be made in Schaufler’s memory to Varna Volunteer Fire Co., 14 Turkey Hill Road, Ithaca NY 14850; or Longview Horticulture Committee, 1 Bella Vista Drive, Ithaca NY 14850. “Peter Davies, professor of plant physiology in the plant biology and horticulture departments, will serve as an adviser to the U.S. government on agricultural and food policy issues during the 2011-12 academic year as a Jefferson Science Fellow in the U.S. Department of State. 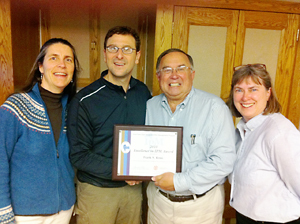 Rossi (second from left) accepts 'Excellence in IPM' award from NYSIPM Program staff on April 25. Associate professor and turf specialist Frank Rossi is featured in an April 28 article in the New York Times (New Art at Lincoln Center: Lawn Care) telling the story of the 7,203-square-foot lawn constructed on top of a restaurant on the north plaza. The lawn was forced to close just two weeks after opening last June because of irrigation problems, but reopened a week later and stayed open until November. “‘These are glitches you get on any project,’ said Frank S. Rossi, a turf grass scientist and associate professor in Cornell University’s horticulture department, who was Lincoln Center’s lawn guru and has been a consultant for the Yankees’ ballfields. ‘Ninety-five percent of the lawn is not differently managed than any lawn in the Hamptons or Scarsdale.’” The lawn is scheduled to reopen May 11. The architects tested and selected a mix of tall fescue and Kentucky bluegrass to stand up to the heavy traffic. “Mr. Rossi said the grass was also selected because it can withstand the ‘heat island effect,’ caused by the surrounding concrete and glass, and requires less water, fertilizer and pesticide than regular lawns. Rossi recently received an Excellence in IPM award from the NYSIPM Program. Read more. This spring, Department of Horticulture research support specialist Brian Caldwell (MS ’86) served on a panel addressing “Profitability of Organic Farming—Findings from U.S. Long-term Experiments” at the USDA’s 2011 Organic Farming Systems Conference in Washington, D.C.
About 200 attendees, mostly from inside the Beltway, heard Caldwell explain how the experiment has confirmed what other researchers are finding in similar experiments around the country: By carefully planning the switch from conventional to organic farming, farmers can make the three-year transition profitably. For example, New York cash grain farmers without livestock to provide manure as a nitrogen source should avoid growing corn during their first year. Soybeans (which fix their own nitrogen), are a far better choice. And by growing a small grain like spelt in the second year of the rotation along with a red clover green manure crop, corn can become a very profitable crop in the third year of the rotation. The experiments are continuing at the Homer C. Thompson Research Farm and the Musgrave Research Farm, managed by the Cornell University Agriculture Experiment Station. Watch video of Caldwell’s presentation below. Read more about the grain experiment in the March/April 2011 issue of What’s Cropping Up. Third in a series of profiles celebrating the Class of 2011. Some of my relatives went to Cornell and I visited the campus for my cousins’ graduations. So I knew a lot about what it was like here. I wasn’t sure what I wanted to do after high school, so I liked that Cornell offered such a diversity of areas of study. I initially thought I wanted to study something related to math or computer science, but also had a burgeoning interest in the natural world. I also knew that I wanted to study abroad and I knew that I had many options with Cornell Abroad. I spent my junior year at the University of Tasmania in Australia where I did independent research on the photobiology of peas using genetic techniques. I had several. I started out majoring in Earth and Atmospheric Sciences. I took biology my freshman year and really liked it, so I switched to Plant Sciences. When I took George Hudler’s class Magical Mushrooms, Mischievous Molds during freshman year, I was really inspired to continue down that path. I’ve taken a lot of paradigm-shifting classes, and they’re usually the ones I go into expecting to get the least out of. I keep finding new things to be passionate about. What was your main extracurricular activity? Why is it important to you? I was in the mushroom hunting club sophomore year and am a member of the Long Island Mycological Club back home. George Hudler’s class really opened my eyes to a new lifetime hobby. When I was in Australia, I joined the scuba and bushwalking clubs. I really wanted some real research experience, so I volunteered in Taryn Baurle’s lab in the Department of Horticulture studying endophytes – fungal symbionts that live inside plant cells. Now I’m working more on computational biology, looking at methods to analyze CT scans of roots. I’m really fascinated by the push to develop computational and quantitative techniques in the biological sciences. 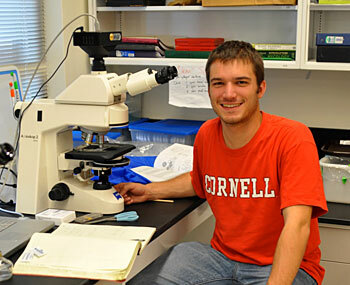 What was one of your greatest challenges attending Cornell? At first I was intimidated because it seemed like everyone was much smarter than I was. After a while, I started to learn how to really apply myself. I guess that, in a way, learning how to approach and solve problems is what school’s supposed to be about. Nothing concrete yet. I’m trying to find an opportunity to work or study abroad again and hopefully get some more research experience. After I satisfy my travel bug I want to go back to school for a master’s degree or a doctorate. 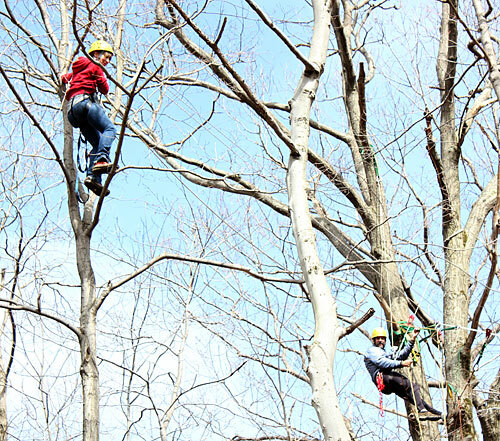 This spring, students in The Nature of Plants (HORT 1115) got a bird’s eye view of some of the forest ecosystems they were studying at the Hoffman Challenge Course on Mt. Pleasant. 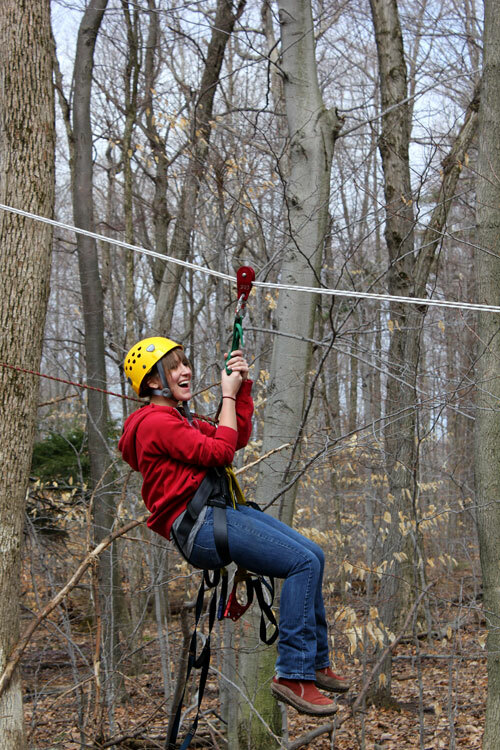 Earlier in the semester, staff and members of Cornell Outdoor Education trained the students on the Lindseth Climbing Wall in Bartels Hall, then they assisted on site over several weekends in April. “The whole idea is for the students to be able to observe from above what they were measuring from below,” says Taryn Bauerle, assistant professor in the Department of Horticulture and the course’s instructor. “It helps them put a face on the data they collect,” she adds. 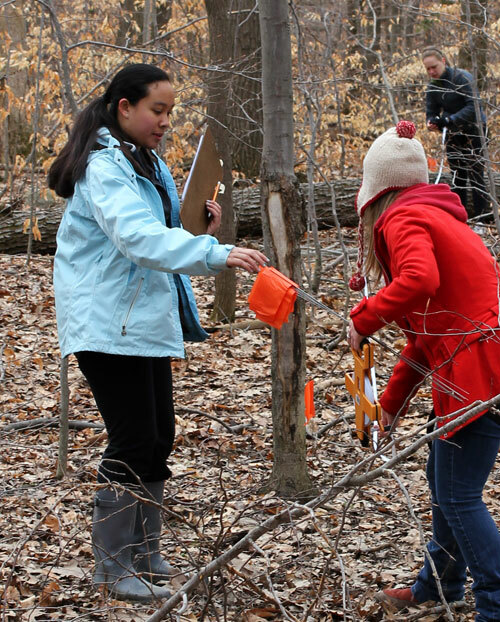 On the ground, students cored trees to determine their age, ran transects and set up plots to collect plant data, and made other observations. They used their data to compare ecosystem structure and function on three different sites – an old growth forest, a recently disturbed area and a spruce plantation planted several decades ago. Graduate student Alex Paya shows students data collected from a portable weather station and soil moisture probes at the site. Students lay out transect to collect data on species diversity. Horticulture volunteer Marc Göbel demonstrates how to remove a tree core to determine its age. 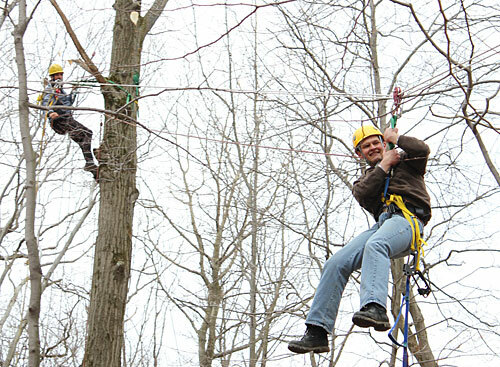 Getting a birds's eye view of forest ecosystems. Here’s his first report from Bethpage State Park. Follow Frank’s Cornell Turfgrass blog for future ‘vlogs’. They will also be available via iTunes later in the season. Three fellows in Cornell Plantations’ Public Garden Leadership program are featured contributors in a recent issue of Public Gardens, The Journal of the American Public Gardens Association. 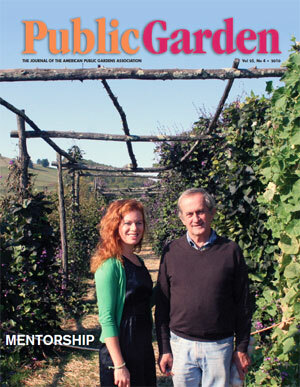 The theme of the issue is Mentorship, and the Plantations Fellows and other students each interview a mentor who inspired them in their pursuit of a career in public horticulture. Ellen Weatherholt ’11 interviews Dr. Janet C. Cole, Oklahoma State University. 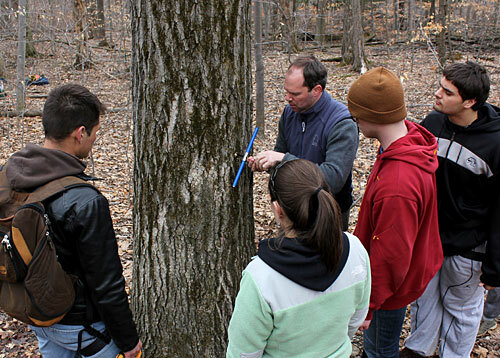 Stephanie Suber ’12 interviews Dr. Robin Kimmerer, SUNY College of Environmental Science and Forestry. Allison Skaer ’12 interviews Sheila Kanotz and Brian Kanotz, Callaway Gardens. 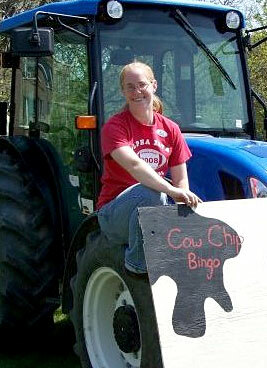 Elizabeth Buck at Ag Day on the Ag Quad. Second in a series of profiles celebrating the Class of 2011. I attended 4-H Career Explorations on campus every summer since middle school. I fell in love with the campus and all the friendly open-minded people here who encouraged us to explore ideas. What was you main Cornell extracurricular activity? Why is it important to you? I’m a member of Alpha Zeta, the co-ed, ag-based fraternity. In addition to sponsoring and organizing Ag Day on campus, we’re very involved in philanthropy. We raised money for 4-H and to help farmers whose barns burned down. We even organized a group of volunteers to help with cranberry harvest on a fraternity brother’s farm in Massachusetts over fall break. 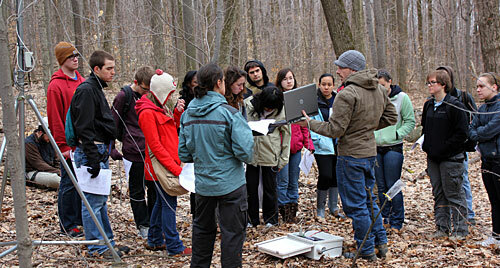 The huge number of hands-on classes in the plant sciences. I work best when there’s a blend of theory and practice. After my sophomore year, I did a summer internship with Cornell Cooperative Extension in Essex County, working with high tunnels (unheated greenhouses that help farmers extend their growing season for vegetables, fruit and flowers). It helped me realize that I really like field research. Before that, I thought getting a Masters degree would be a chore. Now I know that research can be fun and relevant. Last summer, I did more field research as an intern at the New York State Agricultural Experiment Station in Geneva, working on cover crops to suppress weeds and improve soil health. Did any of your beliefs or interests change during your time at Cornell? Coming to Ithaca was mind-opening. I’ve learned to think critically about complicated systems without getting overwhelmed – knowing that I can understand them and change them. Learning how to study. It’s a whole different game than in high school. But once you get the hang of it, it’s a wonderful environment for learning. I also learned that grades don’t necessarily reflect how much you get out of a class. Some of the classes where I learned the most I didn’t necessarily make my best grades. There are so many opportunities here. Find what inspires you and put your heart into it. But don’t forget to stop and make friends, grab pizza and watch the sunset. I want to get my Masters because I’d really like to work for Cooperative Extension. It’s a good place to help people solve problems, and there are opportunities to do research, too. But to be a good educator I think you need to understand growing operations on all levels. I got a lot of experience working in my family’s greenhouse. Now I want to go out and get more experience working with fruit and vegetable growers before I start grad school. I’m a very practical person. 5 Questions for Justine Vanden Heuvel (right) in the April 2011 issue of Appellation Cornell, which is loaded with more news, research and other information. Sustainable sipping: New York produces eco-friendly wines by Amanda Garris published April 20 in the Chronicle Online. “On some New York wines, along with such traits as fruity and bold, could soon be “with hints of sustainable pest management and soil conservation.” Such sustainably produced wine may soon be appearing on a wine list near you.” Read the whole article. CU wine conference addresses aging and keeping of wines (another Garris article in the Chronicle Online April 19) reports on the 40th Annual New York State Wine Industry Workshop that gathered 100 winemakers and enology experts in Geneva, N.Y., April 13-15.